Product #60783 | SKU 996366005 | 0.0 (no ratings yet) Thanks for your rating! 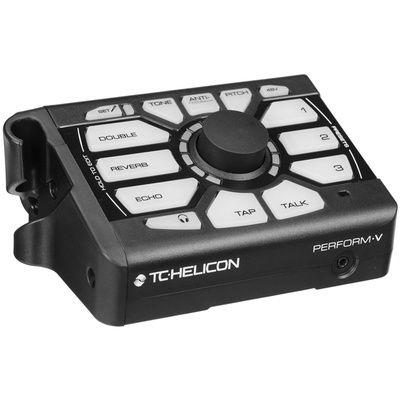 With the Tone control button you can add a factory-set mix of AEQ, Compression, De-Ess, and Gate onto your main output, which can eliminate low-frequency mud, large dynamic shifts, and sibilance, as well as unwanted mic gain while you're not singing. The Talk button bypasses the effects, while keeping the Tone function engaged, for clear communication with your audience. The Perform-V has editable remote presets accessed through the Preset app, which has up to seven effects with four additional modifiers: Harmony Level, HardTune Gender, AEQ Filter, and µMod Level. These presets can be imported into the Perform-V and edited on the fly via the HIT function. The echo effect can be synched to the timing of the music through the tap-tempo control.